The Assassin's Creed franchise has had a presence at nearly every Electronic Entertainment Expo (E3) since 2006, making it one of Ubisoft's biggest franchises. The series is about to head to Ancient Greece, an announcement which received a mixed response from the fanbase, with many hoping for Japan, China or Vikings. With the World Premiere Trailer for Assassin's Creed Odyssey likely to release any day now, this article reflects on the presense of the Assassin's Creed franchise at E3, and the many different ways in which the brand has been promoted at the event. It seems that Ubisoft were initially going to keep the presence of Assassin's Creed Odyssey at E3 a surprise, but images of a leaked keyring caused the company to make an announcement. E3 2006 saw the reveal of Assassin's Creed, and gave the world a glimpse at a franchise which would one day reinvent the meaning of the word assassin. The reveal trailer featured a mysterious figure named Altair, who belonged to a brotherhood of assassins active during the Third Crusade. Game Critics- "Best Action/Adventure Game." IGN, "Best Action Game," "PS3 Game of the Show," "Best PS3 Action Game,"
GameTrailers - "Best of Show,"
1UP.com - "Best of Show"
E3 2009 saw the reveal of Assassin's Creed II, and introduced the world to Italian Assassin, Ezio Auditore. Ubisoft also revealed gameplay at the event, and conducted several interviews in which Patrice Desilets and other developers explained the concept of the Animus, and the continuation of Desmond's story with a new ancestor. E3 2010 gave us the reveal of Assassin's Creed Brotherhood, which would act as the continuation of Ezio's journey. This time around gamers would play as an older Ezio, liberating Rome and other areas from the Templar influence. The gameplay demo revealed that Ezio had become a legend, and was being actively hunted by the Templars. Alongside Brotherhood featured a Multiplayer Game Mode Trailer, giving players the opportunity to play as new characters, and assassinate each other. E3 2011's Ubisoft Conference saw Alex Amancio reveal the next chapter in the Assassin's Creed series, Revelations. This would be Ezio's final game, and would take gamers on a journey in search of the lost secrets of Altair. The reveal trailer featured a captured Ezio in Masyaf castle, the once Assassin headquarters which had since been claimed by mercenaries and Templars. Gameplay was also shown featuring Istanbul, where Ezio would encounter fellow Assassin Yusuf Tazim. E3 2012 saw the reveal of Assassin's Creed III, with Ubisoft this time taking the franchise to the American Revolution. The E3 trailer featured the Battle of Bunker Hill, a historical event that was key to the revolutionary success. It also showed the conflict between the Assassins and Templars, taking place on the battlefield, rather than in the shadows. Producer Francois Pelland informed the audience that the new Assassin, Connor would be involved in a political struggle, involving a new cast of iconic figures. Gameplay for the game was also revealed, featuring a native Assassin who was skilled in the art of tracking and hunting. Ubisoft unveiled Assassin's Creed IV Black Flag at their conference, which would take place during the Golden Age of Piracy. Creative Director Jean Guesdon revealed that the game would feature a brutal pirate experience, whilst discovering the Assassin/ Templar conflict in a new way. The game would also feature epic naval battles and adventures, giving players the opportunity to explore a wealth of new environments, such as jungles, caves and temples. Assassin's Creed Syndicate was explored further at E3 2015, taking the franchise to Victorian London. Unfortunately, many of the details surrounding the game had once again been leaked by news outlet Kotaku, causing Ubisoft to respond by hosting a press event which revealed the game. The E3 cinematic trailer featured Jacob Frye, an Assassins who ran a gang called "The Rooks". The trailer also featured a rival gang leader wearing the Templar cross, showing that the conflict was once again out in the open. Evie Frye (As a playable character) was not revealed until Gamescom 2015, something which Ubisoft had clearly aimed to keep as a surprise. Creative Director Marc-Alexis Côté announced that demos of the game would be playable in 7 cities across Europe and Australia, giving fans who could not attend E3 the opportunity to play. Several gameplay demos were also shown off at the event, focussing on the new combat system. After the announcement by Ubisoft to take a year off, E3 2016 was the perfect opportunity for the company to show off the behinds the scenes video for the upcoming movie. "Assassin's Creed" Film Producer Frank Marshall was invited on stage to inform the audience about the film, revealing that the movie would focus on a new story, yet remaining true to the DNA of the brand. Last year, Assassin's Creed Origins was revealed at the Microsoft Press conference by Jean Guesdon. The return of the series would this time head to Ancient Egypt, and tell the story of the creation of the Assassin Brotherhood. The game would focus on a new character, Bayek, who was the last Medjay of Egypt. Guesdon revealed that his struggle against dark forces that corrupt Egypt would lead to the foundations of the Assassin Brotherhood. 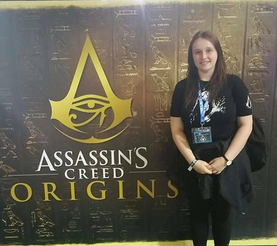 Assassin's Creed Origins was also present at the Ubisoft conference, where Game Director Ashraf Ismail shared more details and footage from the game. The Playstation Conference also featured a new trailer for the game. Ubisoft are set to unveil Assassin's Creed Odyssey at E3, the next chapter which takes place in Ancient Greece. Keep an eye on our social media channels for updates! ​We've teamed up with Access the Animus to raise money for Eagle Heights Wildlife Foundation! 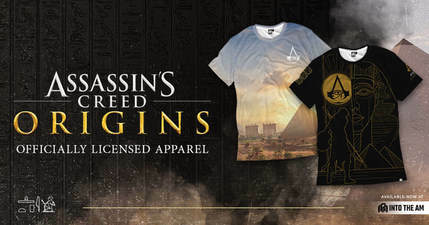 ​You can get 10% off Officially Licenced Assassin's Creed Origins apparel by using the code "TOWCB".